Kakao Pay, the mobile pay solutions unit of South Korean mobile messaging giant Kakao, said Wednesday that its QR code payment option is now available at more than 100,000 partner stores nationwide. The feat was achieved within just three months of launching its QR pay service, Kakao Pay said. QR code pay is a mobile payment and acceptance method through which customers can make payments by scanning a QR code, instead of paying with cash or a credit or debit card. Of the merchants that have adopted Kakao Pay’s QR code payment system, 33 percent were restaurants and cafes and 23 percent were retailers for products like clothing and pharmaceuticals. The service sector, including beauty salons and repair centers, took up 14 percent. The increasing number of Kakao QR pay-compatible stores has also led to an overall increase in the number of QR pay transactions on Kakao Pay. The number of QR pay transactions in August was 3.7 times bigger than that of July, the firm said. A majority of the customers using Kakao’s QR code payment solution were in their 20s (49.2 percent) and 30s (31.5 percent). The QR codes were primarily being used to make small-scale payments, as 61 percent of the transactions were for purchases under 10,000 won ($9). 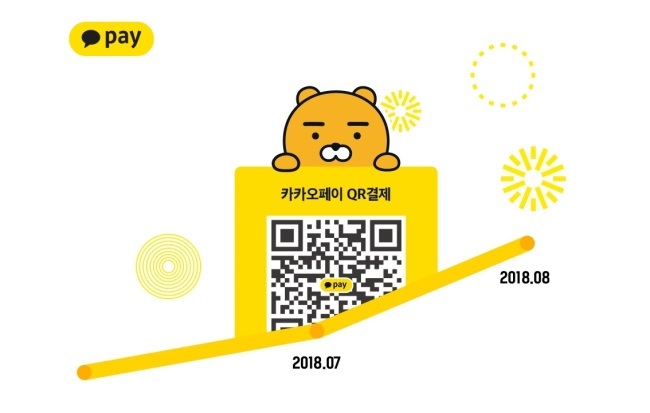 As of August, Kakao Pay’s QR pay system had handled more than 1.8 trillion won worth of transactions. The company expects the number to continue growing with increased adoption, it said. Kakao Pay said its QR pay solution -- designed in line with global QR pay standards -- will become available in not only Korea, but also in Japan and China, benefiting Korean users who travel overseas.